We have waited all summer long for beautiful fall weather and it’s finally here. Fall represents cooler temperatures, changing leaves and the smell of tobacco barns. This is the time of year when families come together around the camp fire, roast marshmallows and tell scary Halloween stories. Our outdoor poly furniture is beautifully made and comfortable for family gatherings or entertaining friends. Whether you are sitting around a fire or reading a book, our furniture is the perfect way to relax and unwind. We offer a variety of outdoor poly furniture including: swings, gliders, chairs and end tables. You can choose the perfect combination that fits your outdoor needs. The best part about our outdoor poly furniture is its durability and resilience to the elements. All our poly furniture comes standard with stainless steel hardware and a 40-year warranty against cracking and fading. This means you can leave it outdoors year-round eliminating the need to move and store it. Many big store names sale expensive outdoor furniture that unfortunately only lasts through one season. At Yoder’s Dutch Barns, our poly furniture is affordable on a variety of budgets and built to last decades. Poly patio furniture is made from recyclable plastics and does not contain any harsh chemicals, making it safe for you children and pets. Since the materials used to make poly furniture are naturally bacteria and mold resistant you can rest assured your poly furniture will be germ free. This also makes cleaning a breeze with just soap and water. Looking to Outfit your Backyard with Outdoor Poly Furniture? 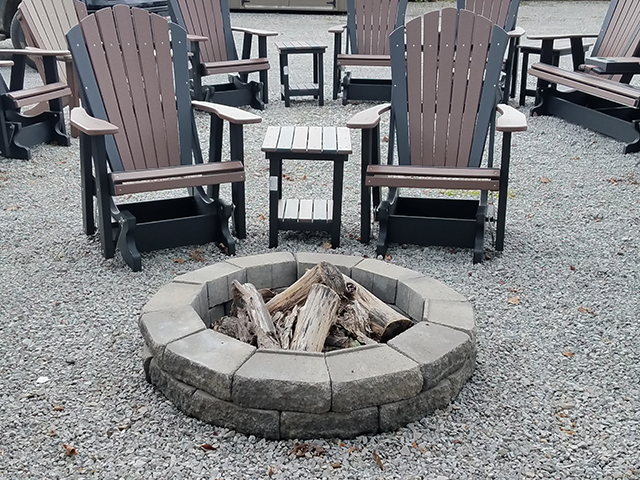 Visit our lot in Cumberland Furnace, TN and see our big selection of poly outdoor patio furniture. Call us today at (615) 789-1030 to place your poly furniture order and ask us about our satisfaction guarantee.